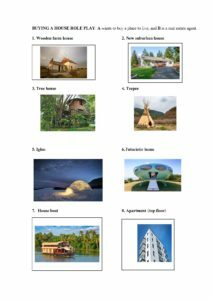 Houses and housing is an easily accessible topic for ESL students. It can be taught at many levels as long as the vocabulary is adapted to the students’ abilities. Role plays, questionnaires, surveys and picture-vocabulary matching exercises are some of the activities that work well with this topic. 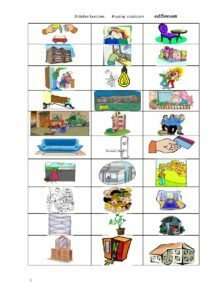 This is a matching activity helping to familiarize students with vocabulary for houses. Students try to match the vocabulary with the appropriate pictures. Click on the image below or the link to download the printable PDF file. 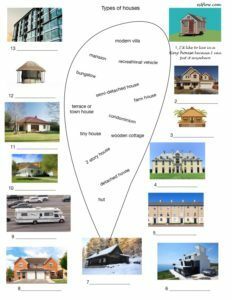 This is a matching activity helping to familiarize students with types of houses. Students try to match the vocabulary with the appropriate pictures. 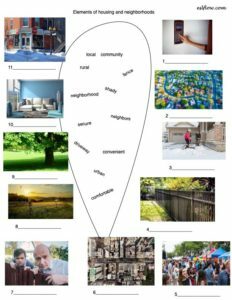 “Elements of housing” includes vocabulary commonly used to talk about housing and lifestyle. This vocabulary is often used to give opinions and discuss the pros and cons of different types of accommodation. Students try to match the vocabulary with the appropriate pictures. 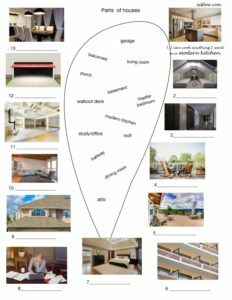 This is an English language brainstorming and planning exercise for a presentation about a dream house. Students consider the factors listed on the page and jot down their ideas. “Housing complaints’ is a slightly more advanced activity for talking about housing . Students match vocabulary to the pictures. Then they can ask each other the the questions at the bottom of the page. An imaginative role play in which students any kind of house they like and perform a role play with a partner using the questions on the second page of the handout. To start this lesson use the housing and lifestyle vocabulary on the Teacher’s Sheet ,page 4 of the PDF. The words correspond to the pictures below ( page 4 of the PDF). Dictate the words randomly row by row. The students have to choose or guess which is the appropriate picture for the word. So they are choosing a word to match one of three pictures. They should write the word in the same box as the picture it matches. The teacher can make sentences using the words to make the context and meaning clearer. Also, spell and explain the meanings of words as necessary. First, I go down the rows one by one so students are choosing from three pictures. Then I come back up to the top and go down row by row again and students choose from two pictures to match the word I am dictating. Click on the image below or the link at right to download the PDF file. 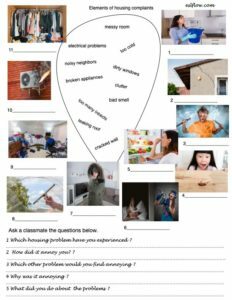 This is an ESL writing worksheet for students to describe a room in their house, apartment or dormitory. First, students brainstorm ideas at the top of the page. Then, they write a paragraph about their room.